Purchased a couple of these chairs for canoeing and kayaking trips this past spring. These chairs are definitely a winner. They pack up small, about 12" x 5" x 5" and weigh about 2 lbs! We purchased ours at SAIL when they were on sale ;-) for 20% off list price of $89. 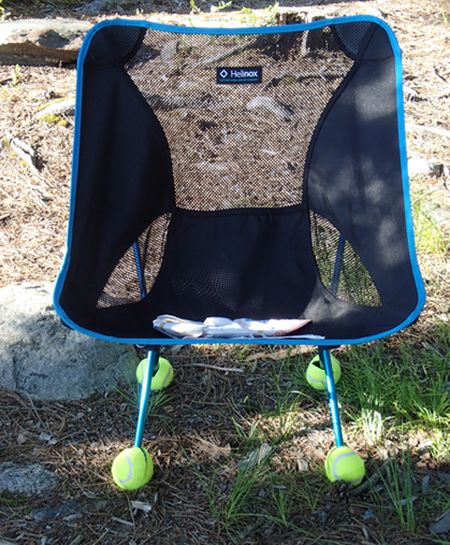 Yep, they're expensive but they are about 4-6 lbs lighter than a normal sling type chair not to mention smaller and they get you off the ground at a comfortable height that still allows you to sit and tend a stove etc at camp. Construction looks to be excellent, I've used mine now for about 3 weeks in the bush and it is showing no signs of wear or failure especially in the area where the sling fits over the poles. Sure feels good to be off the ground and comfortable at the end of a long day of canoeing and portaging!